Thank you to: Nyela D’Endel Wales, Sandy Neumann, Katja Rossberg and Nina for their help with these translations. Please note updated terms have been included at the end of the post in a searchable manner. Each letter has been represented as best as could be using American English letters. I can’t get the two lists of terms to match up with each other. for example: right side (correct side) (RS) lines up with feste Masche (fM). And I read in one of the comments that fM is single crochet, if I’m not mistaken. Is there any way I can get a list that is correctly aligned, please. Thank you, so much, in advance. The pattern is knitted 8 times in the round to round 152. 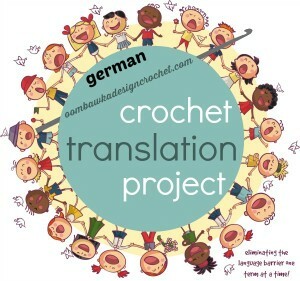 I am trying to translate an old German Crochet pattern for a friend in the USA, I have checked on your German to English US crochet terms and several are simply not there. Would you be interested in adding the German words to your Dictionary of terms? 8 Maschen Anschlag = 8 Stitch start block? Doppelumschlagen = thread crossed over the needle twice for a stitch? Der Mustersatz wird bis zur 152. Runde 8 mal in der Runde Gestrickt = the pattern will be knitted till the the 152 circle 8 times in a circle??? hello, i have purchased a pattern and i cant seem to get it translated at all. is there a site i can go to get this done? im trying to make this for my mom as a puprise and i do not want to take forever to figure it out. its already late as a christmas present for her. thanks and hope that there is someone that can help me out. all i need are the terms to be translated for me into engligh crochet terms. I’d love to have a copy also please. “Air mesh” and “air chain” are indeed literal translations of the German terms “Luftmasche” and “Luftmaschenkette.” This shows why human translators are still in business and machine translation is a poor substitute (lucky for me since I am a translator). The terms mean “chain stitch” and “chain” in crocheting. May I ask, what’s the definition of “air mesh” & “air chain” that I found in a German pattern, translated to English? I have no idea what this “air” thing is. I found a list of German crochet terminology, but neither one is listed, so that’s out. Think you’ll be able to help me? I hope so. Thanks. How can I get the US & German crochet terms list side by side? Here the Vudu ad is in the way. Thanks. If you want my Version mail me! would like to know what the crochet words chopsticks, sticks and rod mean so i can figure out a german pattern. i wanted to know what the crochet words sticks, chopsticks and rod are so i can figure out a german pattern. Russian is a bit trickier I’m afraid. You can try Google Translate. Or maybe try contacting a Russian Designer – perhaps they also speak English? Sorry I cannot be of more help! either Russian or German. Thank you very much Rhondda for the above translation in English. and my heart dies for them. Do you know of any procedure or any source that can help translate these? The refugee women at the Greenery Dwelling project will be very happy to keep busy.